While I constantly try new ideas just to see if they work for me, I keep coming back to the same basic setup. I prefer to shoot a higher-powered lens inside, I consistently shoot a 6x lens, but I have been trying out an 8x most recently. When it comes to lenses I never started off with a low power, I shot a 4x for a year and then went to a 6x and fell in love! The 6 gives me the ability to see the rings on the target while I am still able to distinguish which target is mine and not have my movement be magnified as well. Shop CBE sights and accessories by clicking HERE. I love to pair a medium sized dot with this type of lens. For a year or two I shot a dot that covered the whole yellow on a 3-spot target, since then I have switched to one that only covers the ten ring. The slightly smaller dot kept me from getting lazy. With the big dot it minimized the movement I saw, which in turn left me with a bigger float pattern than intended. The smaller dot helped me get my float pattern minimized and left me with a more consistent shot pattern. What may be found as the simplest aspect but one of the more important pieces of my system is the coloring ring I have screwed into the front of my scope. It helps me line my peep up better around my scope, this can seem like a trivial aspect but if you don’t line it up the same every time it can affect where the arrow lands. Something I do not like shooting for indoor is a pin in my scope. 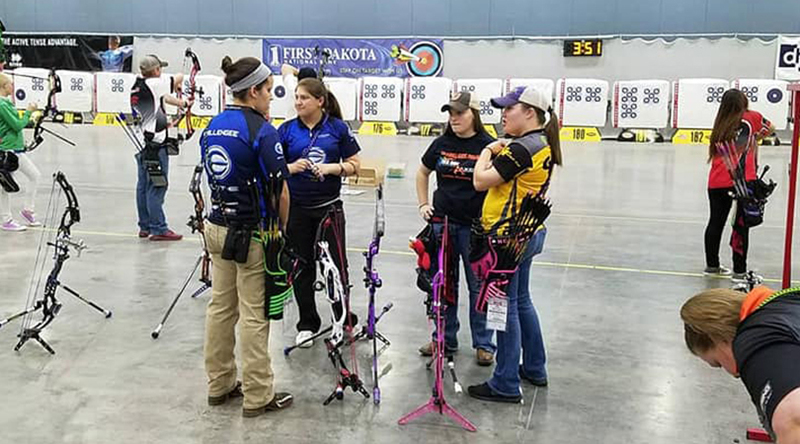 I used to shoot one years ago until I began shooting collegiately, they followed world archery rules which prohibited the use of a light. Without a light I was unable to see my pin as well if I was shooting in a dark range. This is why I began shooting a dot on my lens, and I have never looked back. Not having to rely on a light made my setup a lot simpler because I did not have to remember to put new batteries in my light, or make sure that I had packed extra batteries. I was always awful at remembering to check for these things. With the stress of tournaments, having one less aspect to worry about can be a huge relief! It can be so easy to let one thing slip your mind and next thing you know your light batteries die on you in the middle of a tournament.